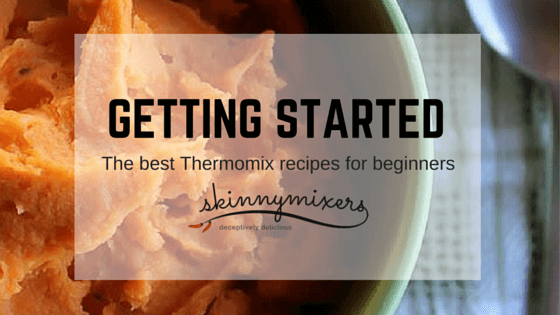 This is a collection of some delicious Skinnymixers Thermomix recipes for beginners that everyone should cook when starting out. They are simple, straight forward and great for beginners. skinnymixer’s Chicken Stock Concentrate – flavour starts with the stock base. Nikalene’s Stock Concentrate will help maximise the flavour of each dish. 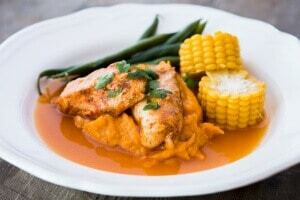 skinnymixer’s Silky Sweet Potato Mash – a fantastic side dish that will become a regular. skinnymixer’s LCHF Chicken Kiev – Freeze some uncooked for an easy dinner. skinnymixer’s Roast Pork Belly with Caramelised Apple Sauce -Great for impressing! skinnymixer’s Creamy Garlic Sauce – delicious over steak or seafood. skinnymixer’s Choc Chip Oat Bars – great for lunch boxes with so many different variations. 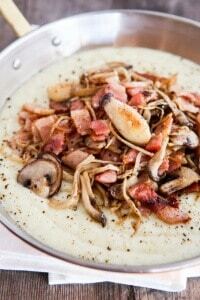 THM: Healthy Carbonara Sauce – this popular, healthy recipe is only available in ‘The Healthy Mix’ cookbook. Or you can jump right in and cook the famous Butter Chicken. It may look long and daunting, but it is really clear and simple to follow. For a first time cooker allow yourself a good 1.5hrs so you aren’t rushed. There is also a great Butter Chicken FAQ page, which will help with making the recipe dairy-free, slow cooker instructions and conversion to ground spices. For helpful tips on using your Thermomix, check out the Advice for New Thermal Cooker Owners page. Lastly, don’t forget to add the Skinnymixers Recipe Index to your phone as a shortcut. This will mean all the Skinnymixers recipes are at your finger tips. Learn how on our ‘Welcome to Skinnymixers’ page. Do you have a recipe that you recommend to new Skinnymixers? Comment below with your best must make recipes…. I own Healthy Mix 1 and India and Asia books…. (Helloooooooo butter chicken!) have just completed my set online using afterpay (shhhh) cant wait to get the new bundle and start mixing. Thanks Nik for a fabulous product!! Hi, I’m about to do the 4Phase Protocol, I am see lots of good recipes in SMBook1, but do you have specific 4Phase recipes? Hey. I’m in love with your reciepees thanks so much for sharing them with us. This might be aa stupid question. A friend of mine told me about the cook key and I was wondering if I would be able to access your recipes on it? Coconut curried sausages!! A favourite in our household! 100% agree! Coconut curried sausages are the bomb-diggity! The nyonya curry is amazing!! I’ve been making Nikalene’s recipes for quite some time now and finally made the nyonya last night and wondered why I had waited so long! It is SO good! Every one of her recipes I have loved!